determined by the appropriate agency. The section provides an impression that there is a quality requirement for kindergarten instruction. "18 units of Early Childhood Education or its equivalent units" must be met. There is a significant difference between 8000, the number of teachers DepEd intends to fund at regular salary level, and 30000, the number that will be required by 1.5 million kindergarten pupils. This is not in any way a small difference. "During the budget hearing, Tinio also pitched for higher pay for volunteer kindergarten teachers, as well as for the regularization of all 23,000 of them. The volunteer teachers get a P3,000 honorarium a month, but could get up to P6,000 if they teach two sessions. Luistro said about 8,000 of them were scheduled to be regularized in 2013. He also said that when the idea of the volunteer kindergarten teacher was put forward, the concept was that these volunteers would be those who have other sources of income and have the time to help out in public schools or want to serve the community. But Luistro said the situation became problematic when the volunteers had teaching as their lone source of income. In such a situation, the honorarium the teacher gets becomes a challenge, he said." 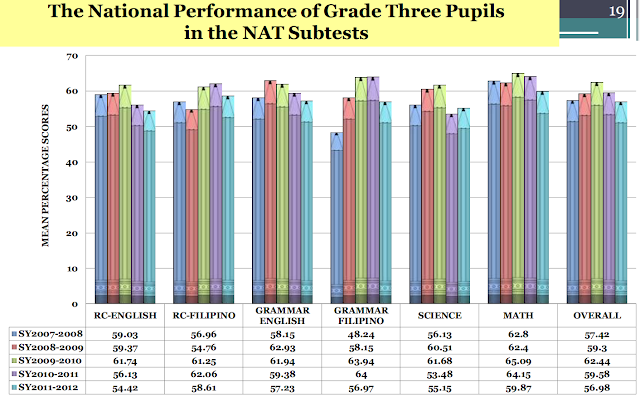 2012 can easily serve as a learning period for DepEd with regard to the kindergarten program. In fact, it is the second year already since DepEd piloted kindergarten before R.A. 10157. And the news above shows that DepEd is more than aware of the challenges of the kindergarten program. 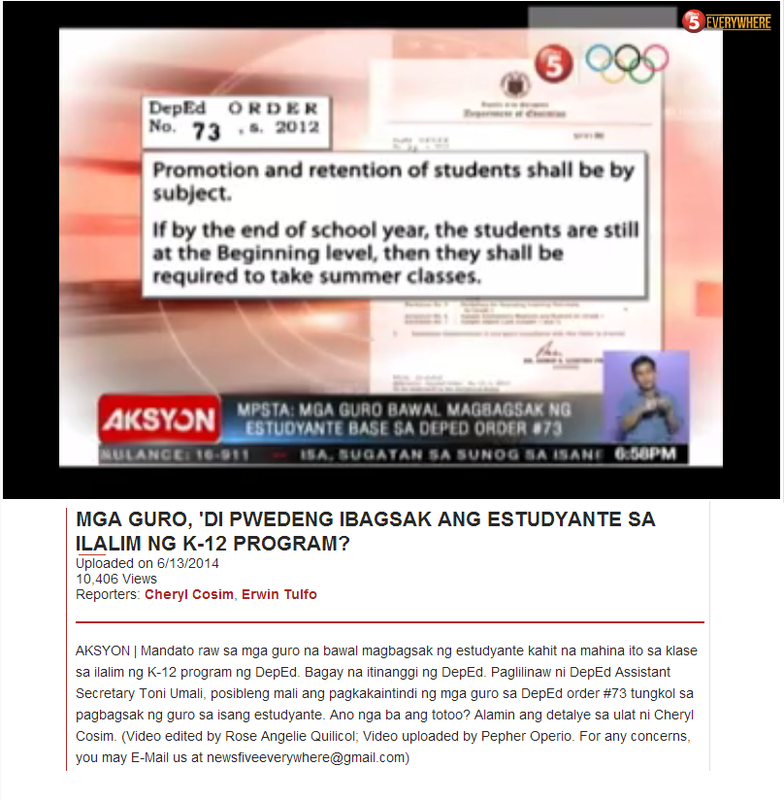 Yet, DepEd simply ignores and continues to ignore the problem. DepEd had unreasonable expectations - that volunteers have other sources of income. Handling two sessions of kindergarten is a full time job. These could only be purely volunteer work among wealthy individuals. How many individuals in the Philippines are wealthy enough to have other sources of income? Second, how many among these individuals have a great sense of community service to in fact dedicate most of their time to kindergarten education? Third, how many among these had 18 units of Early Childhood Education or its equivalent? Lastly, how are these individuals distributed among the various regions of the country? Do they match the distribution needs of the country? Not seeing the above challenge during the first year is excusable. Ignoring the challenge after seeing reality is not. The Philippines does not have more than 20000 individuals who could teach kindergarten and who could get by with only 6000 pesos a month honorarium. If kindergarten is taken seriously as prescribed by R.A. 10157, ignoring this problem goes against the law. This is simple. It is reality staring back at us. Yet, DepEd still maintains optimism with regard to its K to 12 program while it continues to fail in the kindergarten component. It is like claiming that one knows how to multiply numbers while obviously not knowing first how to add numbers. DepEd's K to 12, with its introduction of kindergarten, is a step in this direction. However, its lack of focus on the early years, its poor treatment of kindergarten teachers, and its gargantuan yet diffused programs takes us several steps back. Why is it that the honorarium given to kvt does not on time. Here in zamboanga sibugay we kvt is almost four months that we di didn't receive our honorarium.WHY???????????????? Please make all this things clear to us.kasi sa pinirmahan po naming ccontrata ay ON TIME ang honorarium..bakit mag apat(4) months na wala pa din po..nangngailangan din naman po kami.